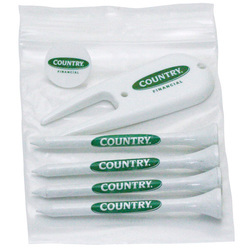 5 - 2 3/4" Golf Tees & 1 Ball Marker Packaged in a Reusable Zip Lock Poly Bag. Great for Handouts at Trade Shows, Golf Tournaments, etc. 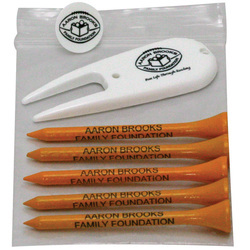 4 - 3 1/4" Golf Tees & 1 Ball Marker Packaged in a Reusable Zip Lock Poly Bag. Great for Handouts at Trade Shows, Golf Tournaments, etc. 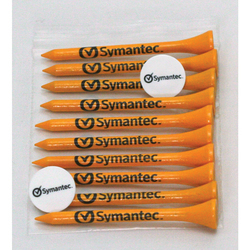 5 - 3 1/4" Golf Tees & 1 Ball Marker Packaged in a Reusable Zip Lock Poly Bag. Great for Handouts at Trade Shows, Golf Tournaments, etc. 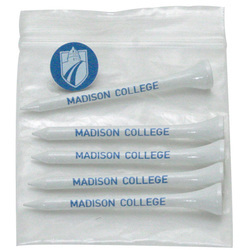 6 - 2 3/4" Golf Tees & 2 Ball Marker Packaged in a Reusable Zip Lock Poly Bag. Great for Handouts at Trade Shows, Golf Tournaments, etc. 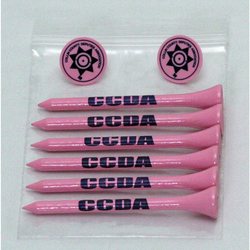 6 - 3 1/4" Golf Tees & 2 Ball Markers Packaged in a Reusable Zip Lock Poly Bag. Great for Handouts at Trade Shows, Golf Tournaments, etc. 10 - 2 3/4" Golf Tees & 2 Ball Marker Packaged in a Reusable Zip Lock Poly Bag. Great for Handouts at Trade Shows, Golf Tournaments, etc. 4- 2 3/4" Golf Tees, 1 Ball Marker and 1 Divot Tool. Packaged in a Reusable Zip Lock Poly Bag. Great for Handouts at Trade Shows, Golf Tournaments, etc. 5- 2 3/4" Golf Tees, 1 Ball Marker and 1 Divot Tool. Packaged in a Reusable Zip Lock Poly Bag. Great for Handouts at Trade Shows, Golf Tournaments, etc. 4- 3 1/4" Golf Tees, 1 Ball Marker and 1 Divot Tool. Packaged in a Reusable Zip Lock Poly Bag. Great for Handouts at Trade Shows, Golf Tournaments, etc.